Oil prices haven’t just declined in recent months – they’ve plummeted. It doesn’t matter what news station you watch or what newspaper you read, someone is talking about it. Most of the time, the media outlets reporting on oil prices don’t do a very good job of explaining the current situation. They simply state where the price currently stands in terms of a dollar amount per barrel and move on to their next order of business. This can be very misleading to the average audience because it insinuates that there is one singular benchmark for oil that is used throughout the globe. In reality, however, liquid petroleum is priced differently depending on its region of origin, and knowing why is important to understanding how oil markets across the world operate as a whole. 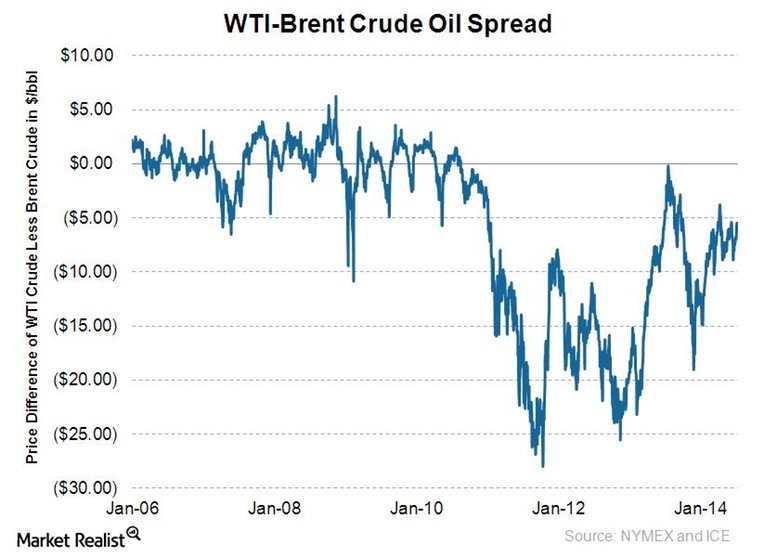 When people talk about the price of oil, they’re talking about crude. Crude is defined as an unrefined petroleum product composed of hydrocarbon deposits – or, in simple terms, oil in its most raw and natural form. Contrary to popular belief, the crude that’s extracted from one part of the world isn’t the same as the crude extracted from another. For instance, what comes out of the ground in Texas and North Dakota isn’t the same as what comes out of the ground in the Middle East or the North Sea. Though they are all classified as liquid petroleum, each is slightly different in its chemical makeup, making it more or less valuable than the others. Similar to beef that you buy in the supermarket, the price of crude varies depending on a number of different factors, one of which is quality. 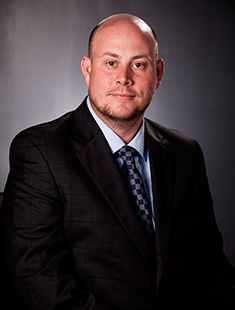 In the case of petroleum, quality refers to how easily the oil can be turned into a “refined” product such as gasoline, diesel, or jet fuel, among others. Sulfur content of crude oil is the most important indicator of quality. The lower the content, the “sweeter” the oil and the easier it is to refine. Crude with high sulfur content is sometimes referred to as “sour”, and while it is still valuable, it requires more work to remove the impurities and therefore is generally traded at a lower premium. 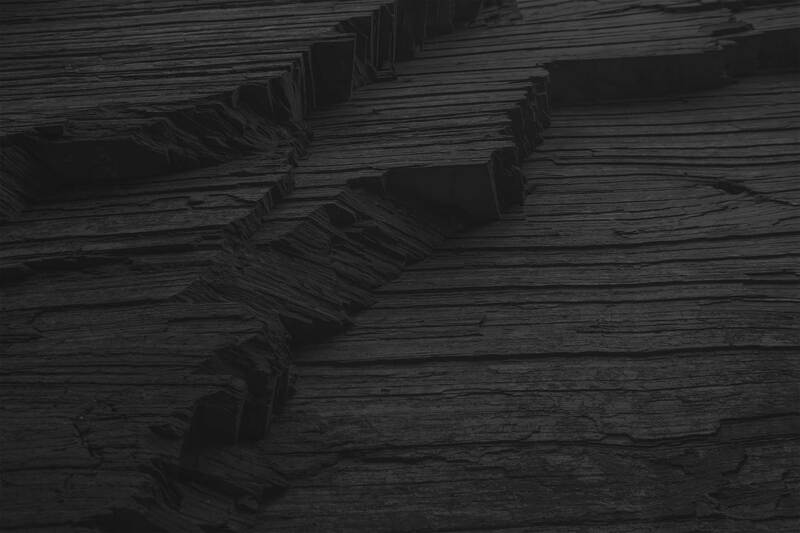 API gravity, which compares the crude’s density to water, is also an important indicator of quality. The higher the API gravity, the lighter the oil. Lighter oil is easier to process than heavier oil and consequently fetches a typically higher price on oil markets. Although there are dozens of different pricing benchmarks for crude oil throughout the world, the two most widely used are Brent and West Texas Intermediate (WTI). 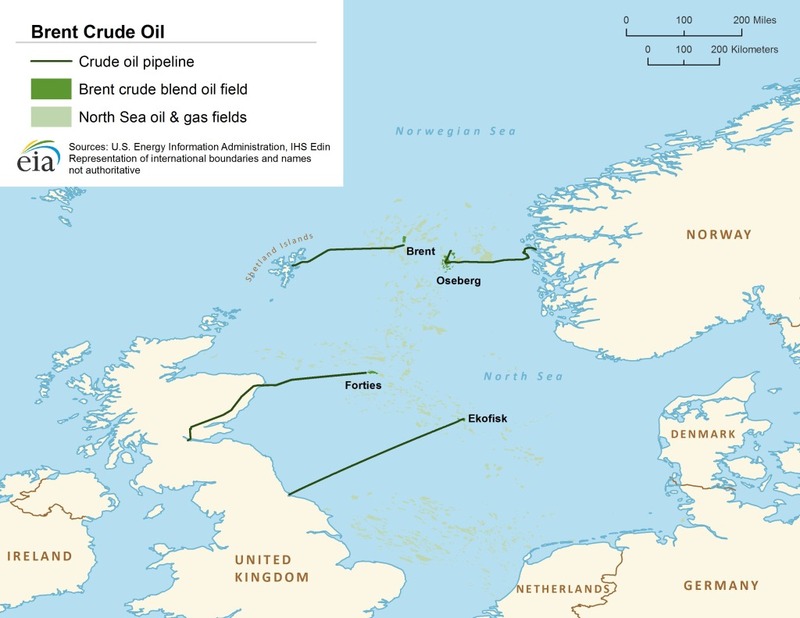 Brent crude originates from four oilfields in the North Sea (Brent, Forties, Oseberg, and Ekofisk). The oil extracted from these fields is typically light and sweet, making it very easy to refine into other products. Roughly two-thirds of all crude contracts around the world use Brent as a pricing benchmark, which makes it the most widely used indicator of oil on the planet. WTI is the benchmark for all crude oil that originates in the US and makes its way by pipeline to the hub in Cushing, Oklahoma. Like Brent, most of the oil extracted in the US – especially in Texas and North Dakota – is light and sweet, making it ideal for refinement. In terms of quality, WTI and Brent crude are very similar. For many years the difference in price between Brent and WTI was minimal – but since 2011, the two benchmarks have diverged. WTI crude is now cheaper than Brent, and the reason why can be summed up in three words: AMERICAN… SHALE…. REVOLUTION. The biggest price driver of any commodity is supply and demand. Quite simply, when supplies increase or demand decreases, prices go down. The primary reason for the divergence of WTI and Brent over the past four years has been the recent surge in US oil production. Shale oil has drastically changed America’s energy landscape for the better but the transformation has been so rapid that the downstream and midstream sectors haven’t been able to keep up. 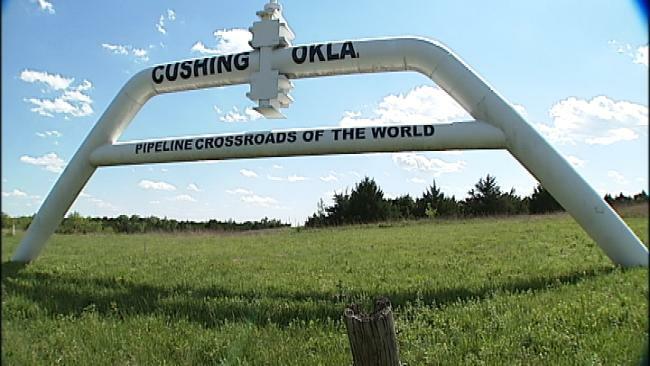 Cushing, Oklahoma, is one of the world’s biggest oil hubs, but its outdated pipeline infrastructure simply wasn’t built to handle the volume of oil that is currently being produced in the US. Before the American Shale Revolution, oil could be sent from Oklahoma to refineries in the north. But in recent years, those facilities have been overwhelmed by production from Canada and North Dakota. Now, almost all of the oil that leaves Cushing heads south to the Gulf Coast – and without enough pipeline capacity to get it there, a supply glut has built up and the price of WTI has gone down. Refining facilities on the Gulf Coast haven’t helped matters either. Until the production surge of oil from North American shale basins, there was no need for domestic refineries to be set up to process it. Most of the oil that was flowing to the Gulf Coast before 2008 was a heavier, more sour blend of crude that was imported from Canada and South America. So when lighter, sweeter grades started coming in from Texas, refineries weren’t fully prepared to process it. This amplified the supply glut, ultimately dragging down the price of US-produced oil even further. Since 2009, downstream infrastructure in the US has adapted in order to better handle domestically-produced crude. Unfortunately, the rate at which new plants have come online and old plants have been retrofitted has severely lagged behind rising production levels. As a result, the price gap between WTI and Brent has remained, though it has fluctuated somewhat. In recent months, crude prices have been on a downward spiral. Why? 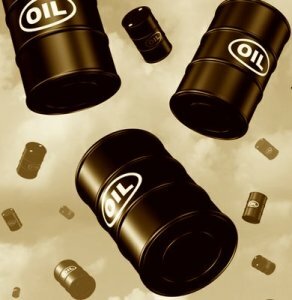 For one: the global oversupply of oil – or at least the perception that a global oversupply will exist in the future, most notably in China and India (two of the world’s largest consumers). For another: with OPEC’s decision in November not to curtail production. As of December 30th, Brent was at $57.88 per barrel and WTI was at $53.61 – their lowest levels since May 2009. Although the ~$4 spread between the two benchmarks may not seem like all that much, it is rather significant considering how low prices currently are. This is especially true for US oil producers, who are prohibited from selling their crude on international markets. The price they receive is directly tied to WTI, so they essentially have to sell their oil to domestic refineries at a discount, which negatively impacts their profitability. It’s very hard to predict what the gap between Brent and WTI will do in the future, but most analysts anticipate that the price discrepancy will remain until the US supply glut is diminished. Exactly how that will be achieved is something that is still up for debate. Isn’t there more to determining oil prices than simply supply and demand? Those are obviously huge determinants, but I’ve always been under the impression that a lot of it is also set by speculators trading oil futures and basically trying to predict what the market will be like in the future. Is that right? I believe you’re right Eric. I think I even read something about that on this blog. I’ll have to look back to try and find it, but I’m pretty sure it’s more than just supply and demand. Frankly I find it a bit complicated that’s why I try to keep up with reading about the industry.